Receive a free 30-minute office or telephone consultation with a network attorney or mediator. A 25% discount is offered with that same attorney or mediator thereafter. Coaches will provide 30 consecutive days of unlimited financial coaching. 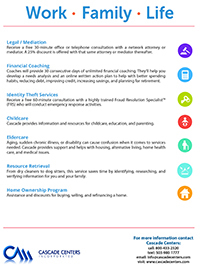 They’ll help you develop a needs analysis and an online written action plan to help with better spending habits, reducing debt, improving credit, increasing savings, and planning for retirement. Receive a free 60-minute consultation with a highly trained Fraud Resolution Specialist™ (FRS) who will conduct emergency response activities. Cascade provides information and resources for childcare, education, and parenting. Aging, sudden chronic illness, or disability can cause confusion when it comes to services needed. Cascade provides support and helps with housing, alternative living, home health care, and medical issues. From dry cleaners to dog sitters, this service saves time by identifying, researching, and verifying information for you and your family. Assistance and discounts for buying, selling, and refinancing a home. To access the Work/Family/Life benefit, please call Cascade Centers at 800–433–2320.